I love ice cream. It’s a classic summertime treat. Most of us have those memories of spending time with friends or family in the summer while we performed that artful balancing act of keeping a scoop on a cone as we raced to eat it before it melted. I myself have fond memories from when I was growing up in Nairobi when my mum would take me to the ice cream shop while she visited her sales clients. There was one specific shop where I would always get a plain cone, no chocolate dip, no sprinkles, with one scoop of chocolate ice cream and one scoop of strawberry ice cream. This was a tradition that I would be treated to every time, without fail. Nowadays though, I totally dislike both ice cream flavours, or so I say, because I’m secretly trying to preserve those childhood flavours in my mind when I reminisce. Those memories become more and more treasured as I get older because as commonplace as an ice cream trip may have been at the age of 3 or 4, it becomes quite the rarity for many of us twenty-somethings and “grown-ups”. Since I refuse to indulge in any strawberry or chocolate, cookies n’ cream is my absolute favourite ice cream flavour , which I’ve been obsessed with since pretty much the first time I tried it. I think we’re going 20 years strong now! What’s your favourite flavour? 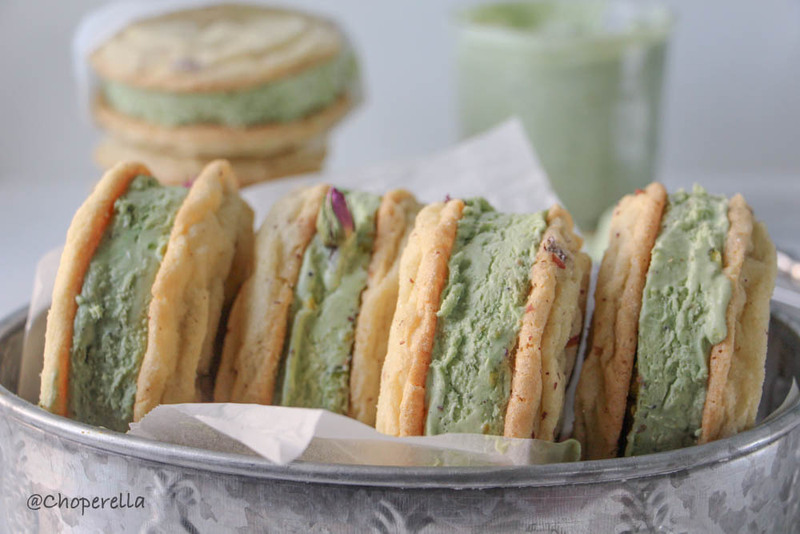 This recipe is a play on one of my favourite ice cream desserts: ice cream sandwiches! I used to love the rectangular ones with the chocolate cookie on either side and what tasted like whipped ice cream in the middle, which never seemed to actually melt…or maybe I just inhaled it so fast that it never had the chance! 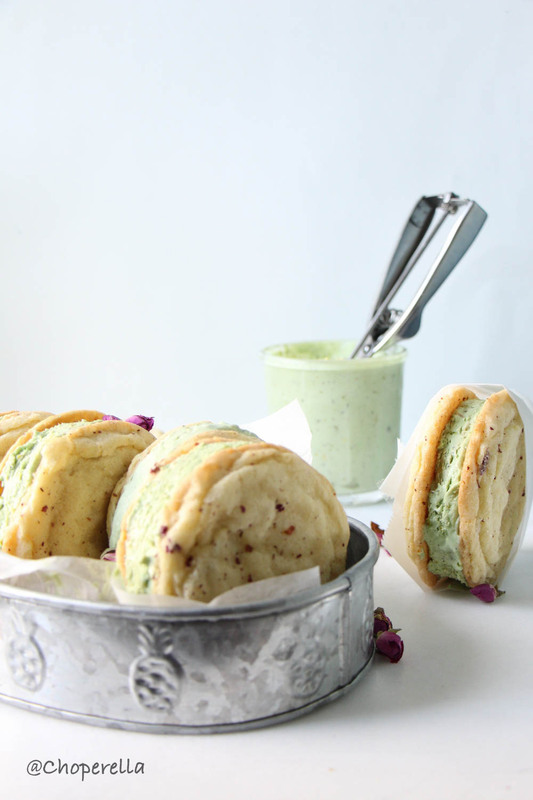 The filling for these oh so delicious, rich and decadent ice cream sandwiches are very similar to a kulfi and are complimented by their sandwich of rose flavoured sugar cookies. 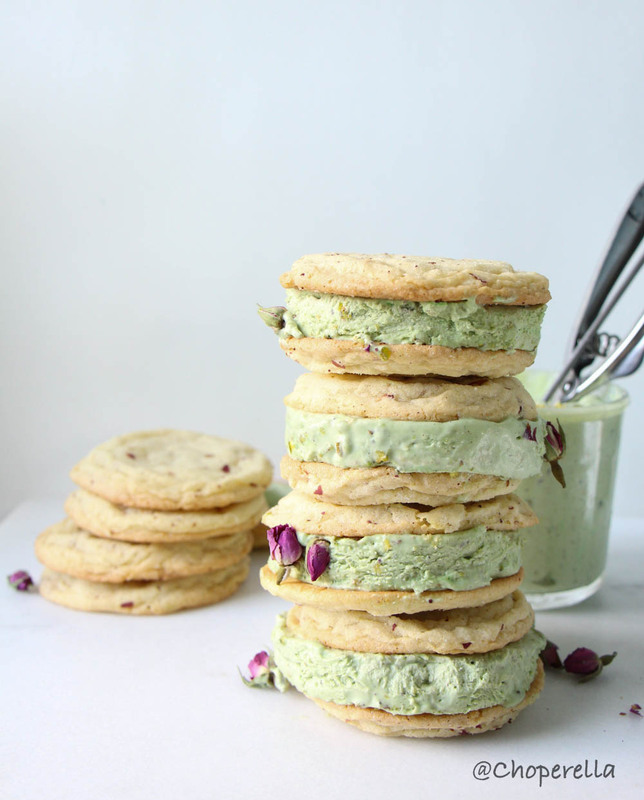 The cookies are hinted with rose and are perfectly chewy as they soften ever so slightly when pressed around the pistachio and cardamom ice cream. 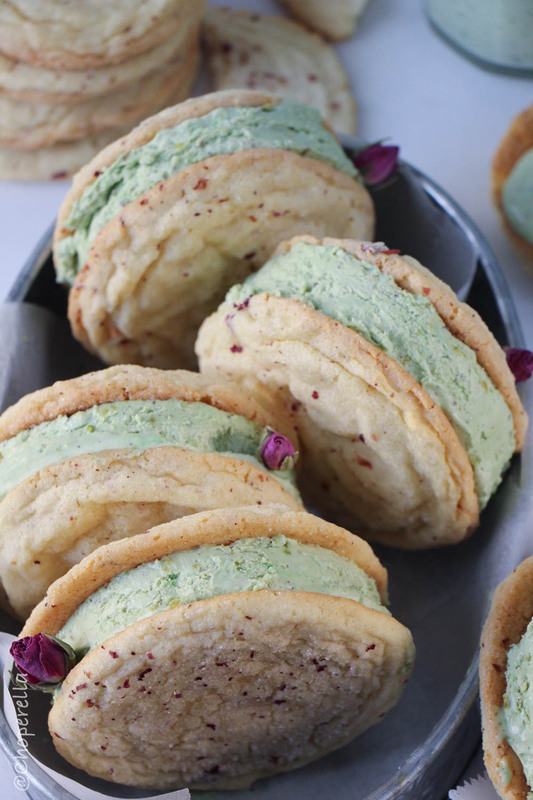 Pistachio, rose and cardamom are very traditional Indian and Middle Eastern flavours that are used in desserts and also in savories. Kulfi is a very popular ice cream dessert in India that is traditionally served on a stick. However, unlike “traditional” ice cream, kulfi is not churned. It’s made with evaporated milk, condensed milk, whipping cream and added flavourings such as pistachio, cardamom, rose and mango among many others. You can find rose extract and dried rose petals at your local Middle Eastern or Indian grocer. 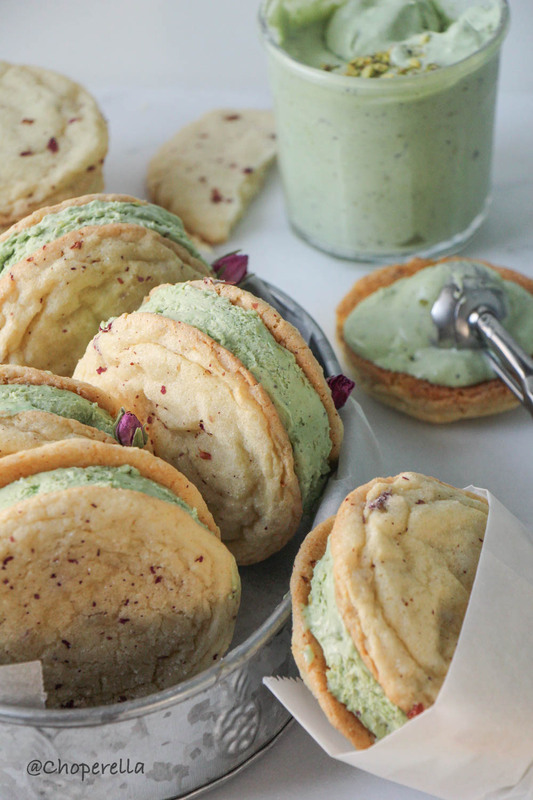 Keep the dried rose petals in the fridge and they’ll last a while! *These are standard sized cookies about 3.5” wide and the ice cream in between is about 1” thick so If you want smaller cookies, use a 1 tsp measurement, and if you want thinner ice cream, spread it on a longer flatter cookie sheet and cut smaller circles. Line a 9”x13” x2” pan with parchment paper. In a bowl, mix the condensed milk, pistachio butter, cardamom powder and chopped pistachios. Using your stand mixer with the whisk attachment, whip the cream until you get stiff peaks. Gently fold in 1/3 of the whipped cream into the condensed milk mix. When combined, add the remaining whipped cream and fold. Do not stir as you want to keep the air bubbles in the mix. 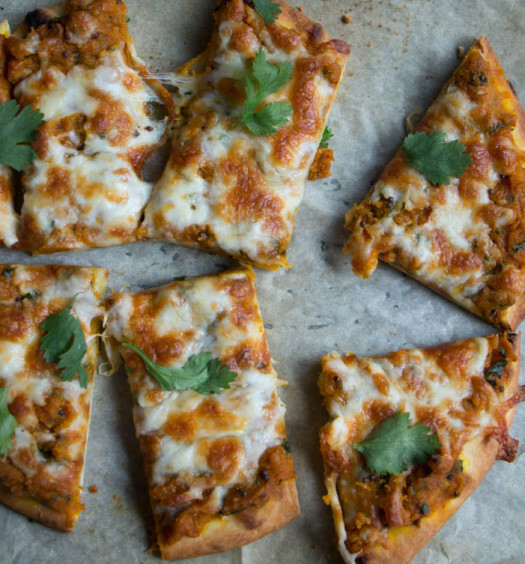 When combined, spread it evenly in the lined pan. Cover with plastic wrap and place in the freezer for at least 4 hours or overnight. When solid, lift the ice cream out of the pan with the parchment paper beneath it. Using a 3.5” cookie cutter (or the same size that matches your cookies) cut rounds from the ice cream. Pre-heat oven to 350°F and line 2 cookie sheets with parchment paper or silpat. In a stand mixer with a paddle attachment, cream the sugar and butter on medium until it turns lighter and fluffy, about 4-5 minutes. Add the eggs and mix to combine. Add the milk and rose extract and combine. Put your mixer on low and add the flour little by little. For the last two spoonfuls, mix the flour in by hand with a wooden spoon. Mix the ¼ cup granulated sugar and crushed rose petals in a small bowl. Using a 2 tbsp ice cream scoop (or a 1 tsp scoop for smaller cookies) scoop the cookies on the cookie sheets 2 inches apart. Sprinkle the rose sugar on top. Bake cookies for 10-12 minutes until lightly golden. They will be slightly puffed in the center, that is okay, it will settle as they cool. When cool, transfer to a cooling rack and continue with the rest of the cookie dough. 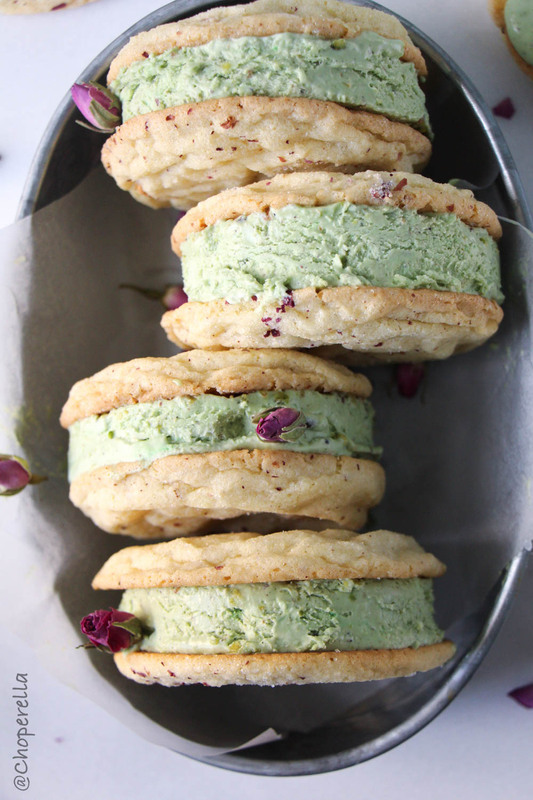 When the cookies are cool, place the rounds of ice cream in between and sandwich with the rose-sugar side out! 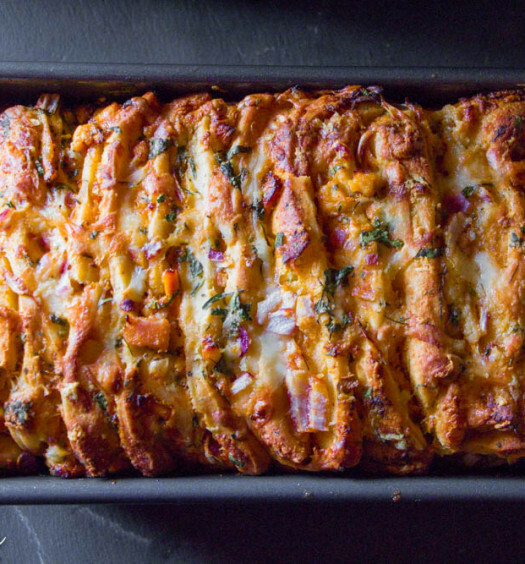 Place in the freezer for 30 minutes to set. Serve and enjoy!